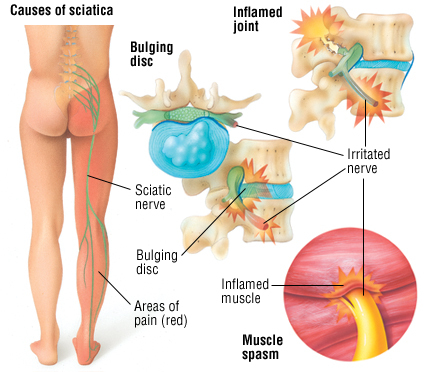 Sciatica describes persistent pain felt along the sciatic nerve. This nerve runs from the lower back, down through the buttock and into the lower leg. It is the longest nerve in the body. Pain results when this nerve is compressed or injured. It most commonly results from inflammation, bony enlargement due to arthritis or a displaced (herniated) disk in the lower spine. Sciatica causes pain that begins in the lower back and spreads through the buttock, leg, calf and, occasionally, the foot. The pain generally will feel dull, aching or burning. Sometimes, it starts gradually, worsens during the night, and is aggravated by motion. Sciatica also can cause tingling, numbness or muscle weakness in the affected leg.